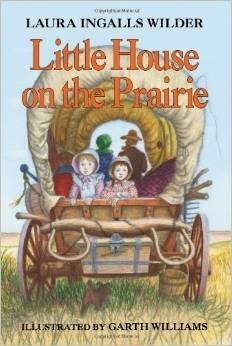 The second book of Laura Ingalls Wilder's series may be the most popular: Little House on the Prairie. It's about overcoming hard times with contentment making the most of the current circumstances. The book opens with the family leaving their cozy log cabin outside of Pepin, Wisconsin. They didn't know the exact destination, but they drove their wagon toward Indian Country. Even getting to Indian Country is a wild ride. After crossing the Mississippi River when it was frozen, they can hear the ice breaking, as sure sign they barely made it. Later, the horses pull the wagon across the creek, but the water rises unexpectedly. Pa jumps out to calm the horses and keep them moving across the river. Jack is sadly swept downstream. Soon the Ingalls family finds a piece of land with rich soil. Pa, Ma, Mary, Laura, and Carrie make this their home. The family works together to make a happy pioneer home on the prairie. Through the everyday life of the Ingalls family, we learn of their hopes and had work. Pa tries to understand the Indians though Ma is scared of them. Some Indians come to the house to be friendly while others come to take cornmeal, tobacco, and furs. During an especially difficult time, Indians chanting and shouting during the night keep the whole family on edge and sleepless. Eventually, we understand that Pa chose his land under the assumption that it was okay-and legal-to settle there. Instead, soldiers would be asked to remove any people within the Indian's territory. Pa doesn't want to be forced to go, so the Ingalls family sets off once again after living for one year on the prairie. So the family packs up and sets out once again. Always moving west and leaving the Little House on the Prairie (affiliate link) behind. 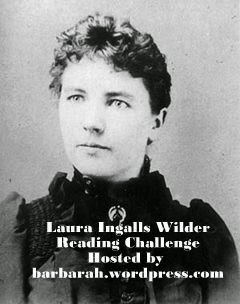 I read this as part of the Laura Ingalls Wilder Reading Challenge at Stray Thoughts. I'm also reading Farmer Boy with my children. If you are interested, in additional books, activities, and fun, be sure to explore Little House Companion. Also consider using the Little House in the Big Woods discussion guide and checking out the Little House party posts.